First off, people here get up freakin’ early. 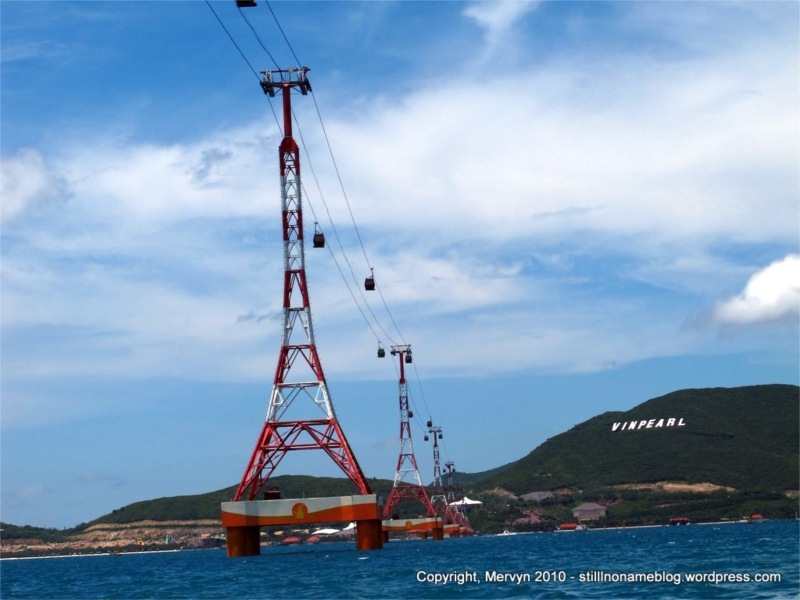 I rolled into Nha Trang, a coastal resort town, on a night bus from Ho Chi Minh City (Saigon) at 5 a.m. this morning. As we motored in through the outskirts of town, we passed people opening their shops, auto repair guys welding parts together, and builders already underway on their construction. It’s not just the adults, either. Kids were kicking around soccer balls and biking to wherever they bike to on an early Saturday morning. Note that they weren’t just up at 5 a.m., they were already working. Fully dressed, clean, nose to the grindstone. If Vietnam achieves developed world status, know that, in part, it’s because these are some early birds. If I were the worm I’d fear for my life. I’d also be an insomniac. A mix of Vietnamese and tourists hopped off at the last stop, the local travelers looking much more spry than their foreign counterparts. I hopped a motorcycle taxi to Rainbow Divers and waited for the shop to open. The dive staff trickled in, then boarded a bus to the docks. Another guy came and opened up the shop, which doubles as a restaurant and bar. I sat down for an iced coffee and gravely disappointed my waitress by not speaking Vietnamese. At around 7 a.m., we departed for the docks. I looked around at the other customers and, per normal, I was the only brown person. We hit the docks, got on the boat, and started heading out to the first dive site about 4 hours away. A kilometer or two out, we stopped for a quick boat briefing. That’s when I got the shock of my nascent diving career: the Vietnamese dive guides outnumbered the foreign dive guides. This may not seem remarkable, but it is. Getting a dive master or instructor certification is quite expensive, even by Western standards. It’s a fortune for most Vietnamese or other Southeast Asians. 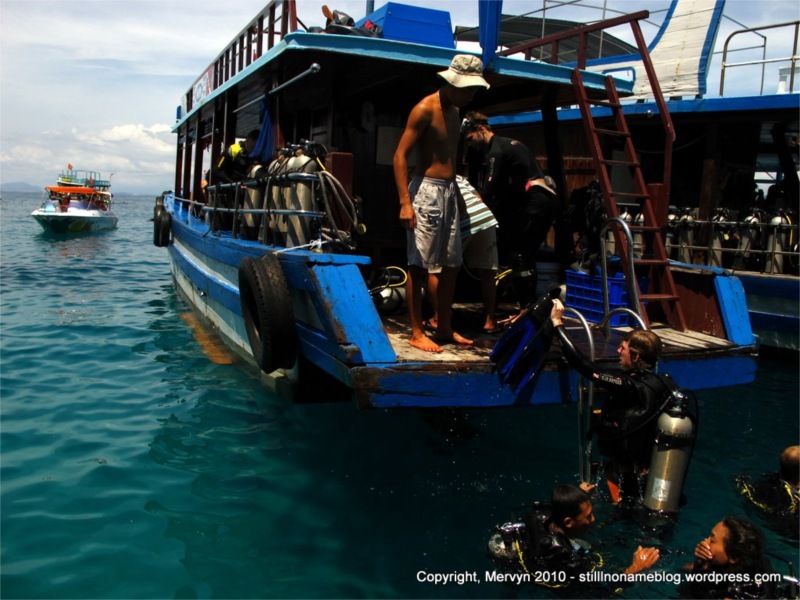 In my 25 dives in Asia, I’ve only met one local dive master and that was way back in Thailand. I also suspect that the textbooks and tests aren’t in Vietnamese. These people have worked hard to get where they’re at. It’s an impressive sight. All of them must have come to the docks on their own, because I didn’t see any of them get on the staff bus at the dive shop. At least I didn’t notice. Perhaps I’m a subconscious racist–maybe they did and I just thought they were all dive boys are snorkel guides. Whatever. They’re here and that makes me happy. 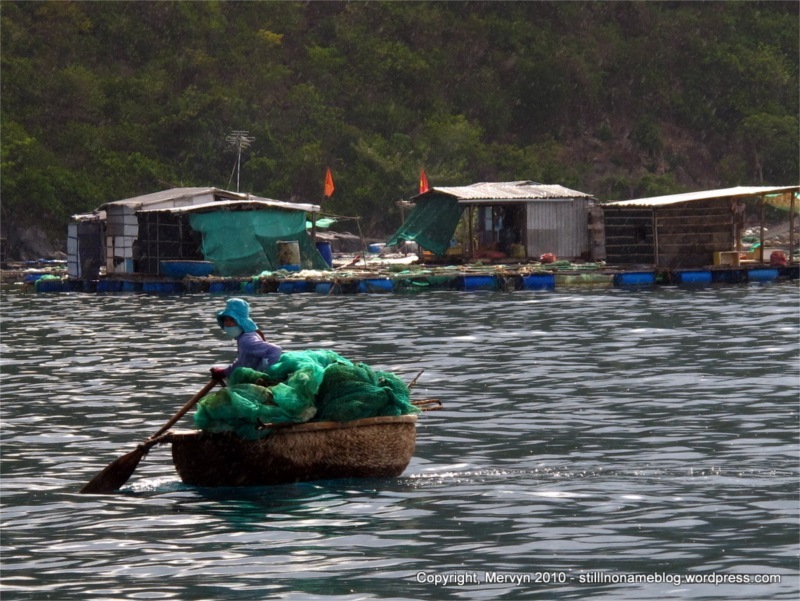 I’ve often wondered what it would take to get locals to run their own dive sites in Asia. Seems like Vietnam’s well on its way. This trend seems to hold up when, after our first dive, we dock with some other dive boats. On other boats I can see and hear Vietnamese teaching other Vietnamese how to dive. Vietnamese in wetsuits are joking with the Vietnamese captains on their boats. On our boat, there’s even a Vietnamese guy who’s diving while his family snorkels. He must have also come to the docks on his own. Or. . .yeah, the racist thing. After our second dive we head back to Nha Trang. There’s no afternoon diving. Something to do with the tides or current. If we want a third dive, we’d have to go at night. 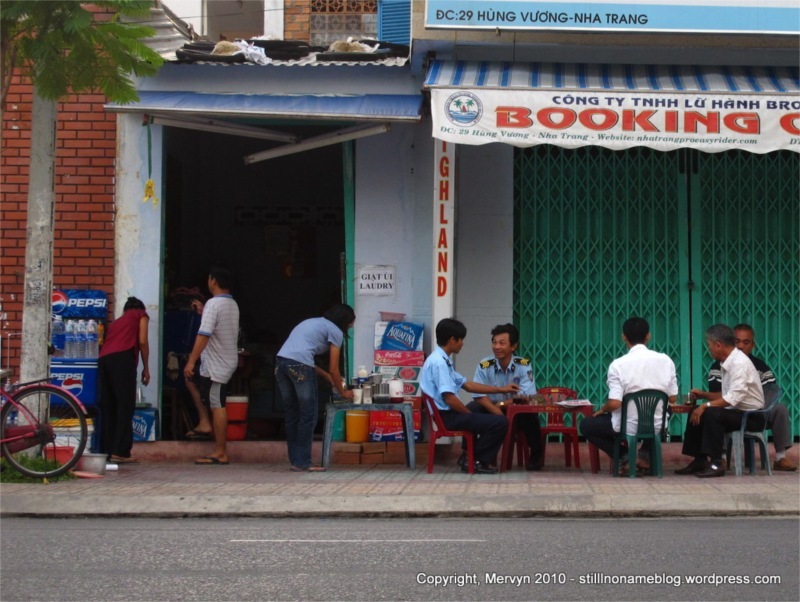 I finished up my dive logbook at the Rainbow Dive restaurant, got it stamped by my Vietnamese guide Khai, and pay up. I head out to find a room. It’s only 1 p.m. and I’ve still got a day ahead of me. Or so I think. I end up spending the afternoon sitting my room, escaping the heat, and watching a movie on TV that’s in English but has Vietnamese subtitles. It’s a crappy, illogical romantic sorta comedy with Hilary Swank, Harry Connick, Jr., and Phoebe from Friends. I watched it mostly to see what I can learn about Vietnamese. I learn something: pronouns are even more complicated than I suspected. Yesterday, I said I counted six terms of address. Well, today I counted 3 more, and only had a mild grasp on when they were used. Yikes. 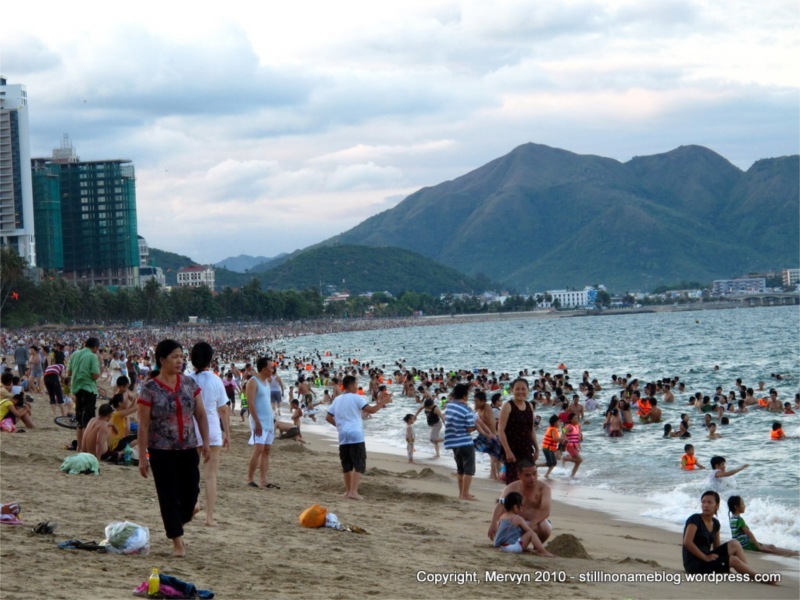 When the heat cools off I head off to Nha Trang’s famed beach. This is a resort town, almost more for locals than for foreigners. When I get to the sand, I find everyone out in the water. It’s like the whole town, plus all their out of town relatives are lounging. Big differences between Vietnamese beaches and American beaches, though. There’s a lot more soccer, a lot less Frisbee (none), and none of the local women are in bikinis. On the last one, I suspect this is a combination of cultural conservatism and a woman’s beauty being tied partially to the lightness of her skin. Whatever it is, all the women I saw were wearing t-shirts and sticking to the shade. The most daring wore short shorts. 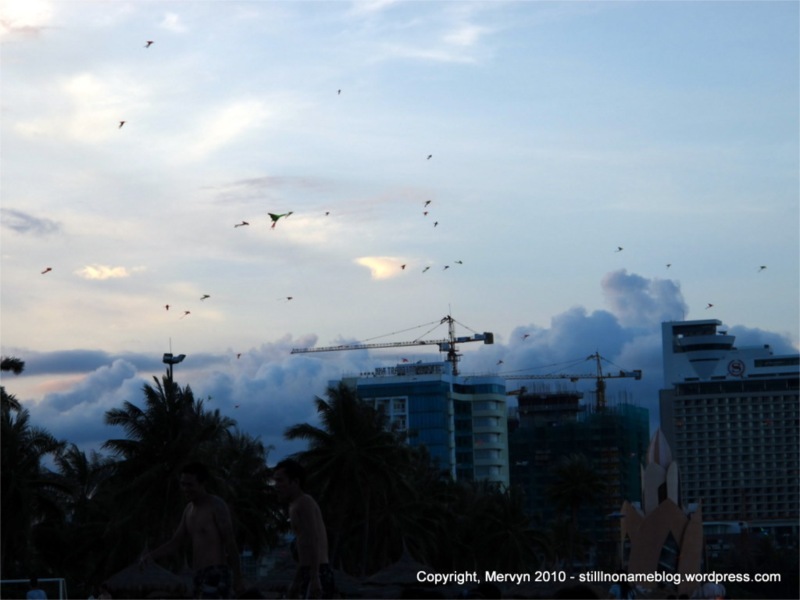 When I looked back inland, I saw what looked like birds or insects hovering in the beachfront breeze. When I looked closer, though, I saw they were kites. Almost a hundred of them. Made me wish I had one. I wandered back to find dinner and do some internet time. I also bought a bus ticket to Hoi An. Tomorrow night I’ll be on another night bus for 12 hours. Fantastic. I roll out at 7 a.m. this time. People will have been working for 2 hours. I’ll just be coming to, hopefully. That’s just fine with this worm. GALLERY: Click through to see today’s gallery which includes all the pics you saw above, plus more pictures of kites, wet t-shirts, brown people diving, and men fishing at the boat dock.